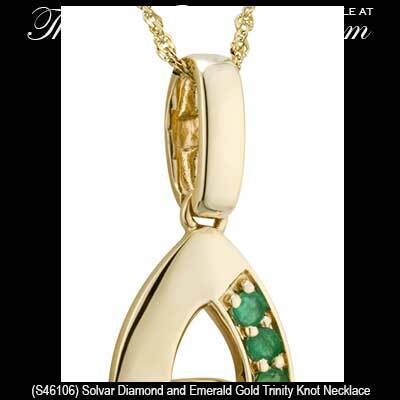 Celtic necklace is a 14K gold Trinity knot that features emeralds and a diamond along with white gold accenting. This 14K gold Celtic necklace with engraved white gold accenting features 3 emeralds along with 1 diamond with a 0.012ct. total diamond weight. 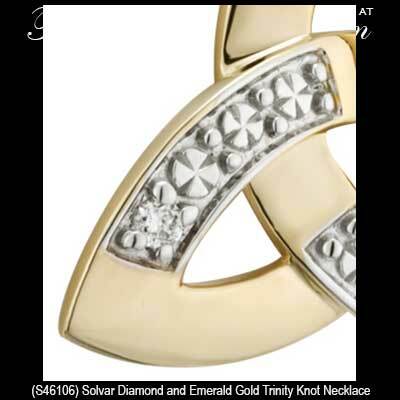 The Trinity knot pendant measures 3/4” wide x 1" tall, including the jump ring and the chain bail, and it includes an 18” long 14K yellow gold chain. 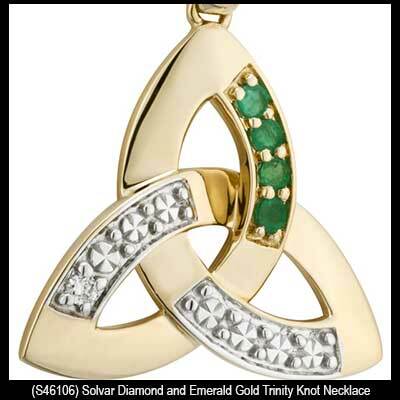 The Trinity necklace is made in Ireland by Solvar Jewelry and it is gift boxed with a Celtic knot history card, complements of The Irish Gift House. Emerald Celtic earrings feature dangling Trinity knots that are cast in 14K gold. Emerald Celtic earrings feature stud Trinity knots that are cast in 14K gold. Gold Celtic earrings are fashioned in the classic Trinity knot motif and are augmented with white gold accenting along with diamonds. Gold Celtic earrings feature drop Trinity knots that are enhanced with a diamond in the engraved fields.